The Uncurated Life: Contest Alert: Want to try Garnier Pure Active? 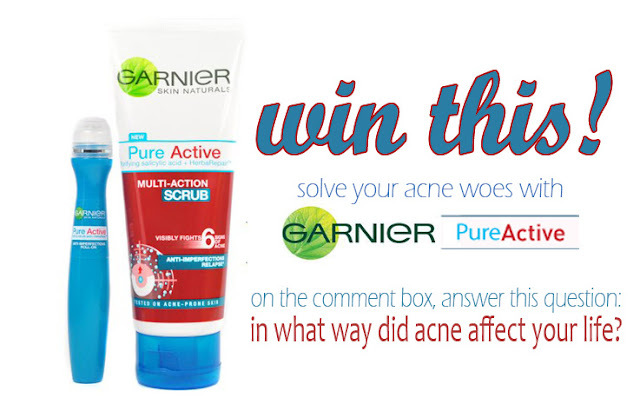 Contest Alert: Want to try Garnier Pure Active? I can totally relate with girls who are having a hard time with their pimples. I do remember feeling conscious and shy because I wasn't like the rest of my friends who have smooth skin, free from pimples. It took a lot of effort and changes just so I can enjoy a face that is void of acne. But it did pay off. When I was introduced to Garnier Pure Active, I admit that I was a bit hesitant. Seldom do I come by over-the-counter products that really solves my acne problems. But the Salicylic Acid convinced me to give it try. Not to mention that I am a big fan or their Garnier Light Eye Roll-on and their BB Roll-on. And with almost 2 weeks of use of the Pure Active Facial Scrub, my pimples have lessened and my face looked cleaner and clearer. And when using the Pure Active Roll-on, my pimple have visibly decreased in redness and have dried up in just 2 to 3 days. Because of this, I want to share these 2 products with you! "In what way did acne affect your life?" It would help if you like me on Facebook (/shensaddictionpage) and follow me on Twitter (@shensaddiction)! Share and tweet this, too! Pretty Please? Place your answer at the comment box below with your name and email address. Contest ends on April 6, 2012! I don't have many pimples but when I get one, it will surely leave a scar. During my PMS, I usually get one or two pimples. It's really hard to conceal the redness as I don't want to put on too much make up when I got zits. It is also hard to erase those pimple marks. It affected my life because those scars ruins my flawless and smooth skin which can lower my self-esteem though I'm consistently using spot corrector/whitening creams. In what way did acne affect my life? - It's been 7 years now, and I am still combating pimples. I keep on switching products just to find the perfect one that will stop this dilemma, and still I haven't found the right one. This acne problem started when I was in 3rd year high school, I know it's normal when you've got few pimples due to menstrual period, stress and as part of being teenager. Pero yung naexperience ko is somehow not normal. You know the feeling na when you wake up in the morning and you have to go to school, and boom! lots of pimples on your both cheeks, nose, forehead, chin, nakakahiyang pumasok. You even wanted na takpan yung face mo when some of your classmates talk about you, and making fun of your face because of the big zit on your nose. You can't even pose on the camera with the other side of your face because you have a lot of acne on that side. And the 50% compliment 50% lait na "May itsura sana sya, kaya lang ang daming tigidig (acne)". CONFIDENCE? That's what you've lost everytime you see your face on the mirror.I keep on asking, 'di ka na kagandahan, ang dami mo pang tigyawat! And I even starting to hate my face. Acne affects me a alot, even now, kahit na patapos na ko sa stage ng pagiging teenager, I use to depend on make-up just to hide those acne and acne scars. I even think na baka di ako matanggap sa work dahil sa itsura ko nung time na nagaapply ako. And the saddest part po, you have to face the computer a couple of minutes and edit your pictures on Photoshop before you post your picture on your FB account and try to fool the others that you have the flawless face but in reality, when they see you in personal, you know that they will see the big difference. And most of all, you will envy those girls who has flawless skin even without using any maintenance on their face. Those are the things that I experienced and still experiencing because of pimples. Lack of confidence, faking my pictures, hating myself, blaming some products and envying the others face, that how the pimples affect me. (Hehe sorry Ms.Shen, this comment is too long hehe I know you'll understand what I feel). In what way did acne affect my life? When I was younger, undergoing puberty was very confusing and my self esteem was at its lowest. I was surrounded by good-looking cousins who seemed like they could never be ugly. Then I started getting pimples! I've never felt more like an ugly duckling in my life. I didn't even know how to use makeup back then so there was no way of concealing them. It was really hard. When your self-esteem is in question, your confidence just goes lower and then you start to feel bad for yourself. I'm hoping to never get pimples again! I readily believe that God has given me a perfect face, not perfect, but close to a flawless face. I don't usually have acnes, but when I do, I wash my face every time. And when there's zit, I pick it. Then a small dark spot on my face can be seen. TO remove and wash it away, I wash my face with facial wash. I was one of the few lucky ones who actually survived high school without any acne whatsoever. But then, when I thought I was saved for life, I started breaking out right after I gave birth. To this day, I am battling acne on a regular basis and I actually go for regular facials now - something that I never had to do before. I even have to style my hair to cover forehead acne every now and then. It's sad, but hey, I haven't found the perfect product to deal with it. This might just be what I am looking for. im aware that when im talking to someone, they are not looking in my eyes, they focus on my zits! nakakabawas ng self confidence! magbabarkada panaman mga tigyawat ko, they grow in group! with redness and sometimes infection because i tend to prick those uglies, really is my frustration. i try to hide it with concealer and foundation, but i know na hindi maganda nalagi gawin un kc lalu cla nagagalit wika nga...plus, pagnagdry na cla, they leave dark spots! i try to hide them with bangs and i know bad din un, kakafrustrate! nakakawalang gana mag make up minsan kc hindi smooth ang canvass.. i try to let my skin breath, so when im at home, i just wash my face, mejo hesitant nadin ako maglagay ng moisturizer dahil feeling q i dont need to, oil factory naq! :( im really in search with the right products that'll help me with my skin problem.. In what way did acne affect your life?, until now, I'm still battling with my self confidence. Pimples on my face always makes me feel shy and lose my confidence when talking to people. I thought that pimples would stop coming after puberty but it keeps on coming every month everytime I have my monthly menstruation. I really hate it and I envy people who have clear skins. it affects to the point that it ruins my days..and its miserable! promise! its my everyday prob since then.since i became a teenager & now the im in my late 20's.i dont see myself beautiful bcoz of this.thats why im hoping someday i'll overcome this. I want to win this contest for my boyfriend. Since ng nagpunta sya sa Italy naglabasan na ang Acne niya, he's still cute though . I remember nung ipinakilala ko siya sa family ko, the first thing na napasin nila is yung face niya. Kasi kapansin-pansin talaga. Ikinwento niya sa akin na lagi siyang tinutukso ng mga friends niya before, and worst, nababasted sa mga girls. Madami na siyang na try na products, kaya lang wala talaga. Hindi effective sa knya. Mag 9 years na sya na nagssuffer sa Acne. Minsan talaga naddepress na sya and ayoko siya makita na ganon. Nawawalan siya ng self-confidence, lalo na pag nag-a-apply sa work and pag humaharap sa ibang tao. I love him so much and I always will. I decided to join this contest para sa kanya. "In what way did acne affect your life?" - I always have acne during my highschool days, it affected my confidence and self-esteem.. especially when i am around with my friends and with my crush (of course). All i do to hide it is through my bangs. Hehehe. Thank God after college up to now, i dont get those acnes anymore but when i do have one, I get really annoyed and uneasy with it. Hi, my name's Trina,.I'm from the Philippines. I've been wanting to have a smooth and acne free skin (particularly in face). When I was in my adolescence stage, my friends keep on noticing acne's, rashes and pimples on my face. I tried using a lot of products to remove all of this but I failed. I once experienced when my friend introduced me to her friend, I was about to kiss her on her chicks but she refuses and just raised her hands acting to shake. I felt the rejection upon seeing her facial expression as well as her reaction after she shake my hands. I've been wanting to work abroad though not with the profession I finished when I was in college. My cousin works in Bahrain and she told me that they're in need of receptionist. My height passed the qualifications but I'm afraid my face won't. But, I still give it a try to apply and the saddest part was I failed. The "boss" honestly told me to try applying some other time (but in my mind, it's as if she wants to tell me to fix or cure or better remove the stuffs on my face). I've also experienced having relationships but most of them left me. And most of them notice what's on my face. I felt like they don't want to look at me or to even kiss me or even touch my skin to them. I'm a teacher and my students also notices the acne's, rashes and pimples on my face. I hope that this contest will help me to have confidence to face the world and the people within me. Acne affect my life into many ways. 16 years of age lang po ako pero grabe na ang apekto nito sa akin dahil sa mga acne's nato ninakaw nito ang self confidence ko na makihalubilo at makipag usap sa ibang tao. At dahil sa mga acne nato hindi ko makuhang ma enjoy ang buhay teenager. Kinakailangan ko pa po na mag make up para lang matakpan kahit konti yung mga acne ko. Pero napag isip isip ko na, "ganito nalang ba ako araw-araw, habang buhay?" Gusto ko na silang mawala pero hindi ko alam kung paano. Marami nakong na try pero sa una lang sila maganda lalo na ang celeteque. Ive been using this product for 4 months. On my first 2 months effective sya pero nung 3rd and 4th month na grabe na yung brakeout sa skin ko. Im still continue using this product kase sabi ko sa sarili ko na mawawala din to. Pero hindi talag eh, sobrang dami na nya. Kaya po ngayon ang target ko this summer vacation alisin lahat sila (acne) sa buhay ko. Para naman pag dating ng school year ay mababago na pamumuhay ko. Iwant to win in this contest. Hoping na ito na ang makakatulong sa matagal ko ng problema. Ever since I started High school I've had acne. And it has been my constant companion until now right when I'm about to graduate college. I've tried every pimple-busting soaps, creams and gels from Neutrogena, Loreal Eskinol to Cetaphil. I've even tried baby soap and oilatum, none worked. And I try to cover it up by using concealers and foundation. It's been hard on my self-esteem as with other people who have acne and I really want to wear light to completely no make-up whenever I go out but my skin gets easily irritated. I hope to try this to see if it will finally cure my skin problem and cure me from my low confidence. way back my college days, the popping out of acne on my face always made me feel conscious. i felt so awkward when speaking with other people or in front of the class. concerned and I didn't want to go to school because I was too embarrassed. "Why is your skin so ugly?" your face looks messed up." I would go to the bathroom and cry whenever that happened. remained on my face, it scarred my skin and my heart. I'm adult, I have a bit more confidence and care less what people think of me. I have oily skin and it has been a problem to me for a long time. I have long suffered from embarrassing pimples, whiteheads, and blackheads in my entire life. Treating acne by trying out acne treating solutions over the counter has been my way of life to prevent additional breakouts and scars on my face. I am now trying to figure out ways to cure my acne so I may be able to sport a "no makeup look". I feel like I don't look right no matter how hard I try or dress up and look nice. There is always that area of pimples there, and it is very unsetting. There really hasn't been a day gone by that I don't think about id, or look at my face. Should I spend that much energy on it? I could be doing other things, instead of wasting 5 to 10 minutes everyday looking at my face in the mirror. I wasn't able to go to my hs prom because of my pimples.I was so ashamed to face my date because of this problem. it just hurts and you lose confidence. i dont want to experience it again. I rarely had acne and pimples in my youth. I remember having once in a year and i will eventually freak out when i see one but I guess when you get older and you had many obligations and received more stress in life, as much as you don't want it, they will eventually show . It makes me cry when i see many acne in my face and i said, what's happening to me. Even if i wanted to treat it, i have no idea what i should do, i have tried some products but it didn't worked for me. I really feel low that time and i feel like i'm really ugly and shy. I guess if i only knew this product, i could have use it that time. What a real bad memory.